Most people are familiar with the literary anecdote of how Nikolaj Gogol, the famous 18th century Russian – Ukrainian writer, burned his last book, the second part of “Dead Souls”, in a moment of enlightened insanity, a few days before his death. Few people however know that, following a negative appraisal, Gogol also burned his first book. A book Nikolaj Gogol didn’t burn was the play “The Government Inspector”. An omission he deeply came to regret. Not that there is something wrong with the play, on the contrary. With one blow, Gogol shattered the notions of what a comedy should be and set the standard for future generations. Kropotkin voiced the general opinion: “[ The Government Inspector is] a starting point for the Russian drama--a model which every dramatic writer after Gogol has always kept before his eyes”.The producer Meyerhold confirmed that although the play was “constructed according to various established dramatic premises, there could be no doubt that far from being the culmination of a tradition, it was the start of a new one”. Notwithstanding its epochal importance and huge commercial success, this satirical play, a genial comedy of errors portraying human greed, stupidity and corruption was a disaster for Gogol. Not only did it divide and antagonize Gogol’s earlier admirers but it also brutally shoved the fragile and emotional author into the spotlight of a vicious political controversy which would tip him over on a mental slope and which would culminate in the writer’s final mental breakdown. The success of the play however has never withered. The corrupt “Gorodnichiy” or Governor of a small provincial Russian town is warned by a friend that a “Revizor”, a Government inspector will soon arrive from St Petersburg, to inquire into the conditions of the local administration. Worse, the inspector will arrive incognito in order to catch the corrupt functionaries “in flagrante delicto”. The Governor immediately convokes the chief functionaries of the town: The head of the hospital, the chief Magistrate and the chief of the Post office. He warns them to put immediately order in their respective offices. The sick in the hospital for example live in linen “so dirty that you might take them for chimney sweeps”. The chief magistrate, a hunter, keeps his hunting gear in the Court, and accepts hunting dogs as bribes. The Governor himself, at the top of the pyramid is the most rapacious corrupt of the bunch. He has levied unlawful taxes, pocketed Government money, accepted ludicrous bribes and even flogged the wife of a non-commissioned officer! While everybody is hastily covering up their misdeeds, a suspicious person is spotted at the local inn. His name we learn is Khlestakov, a young civil servant, an upper-class twit en route to his father’s estate. Khlestakov is in big trouble, as he is penniless and the inn-keeper refuses to further serve him food and threatens to involve the Police. By a turn of circumstances and Khlestakov’s funnily arrogant behavior, the Governor, terrified of the upcoming control, suspects the stranger to be the “incognito” Revizor. The reader, or better the audience, immediately understands that Khlestakov is not the Inspector. A most comic scene, where the young man thinks that the Governor comes to arrest him, and the Governor thinking that he is speaking to the Inspector-General trying to conceal his identity, unleashes a wild polka of misunderstandings, comical situations, farces, misdeeds and a diabolical string of developments who will culminate in a hilarious “coup de theater”. Gogol promised a “comedy funnier than hell” and there is indeed something brilliantly diabolic in it. From the comical situation, to the characters like the idiotic Dobtchinski and Bobtchinski, the word-play, the farcical slapstick situations, all elements contribute to this masterpiece.The funniest aspect of all is that there is not one honest character in the whole play! Not only is there the wild Khlestakov character, with his opportunism and arrogance that every time proofs to work, but everybody on stage is involved in one way or another in lying, cheating and bribing. Still they remain sympathetic for they chase wild, unrealistic dreams and we know they will not get away with it. There is the hilarious Mother – daughter relation, who are both competing for the attention and love of diabolical Khlestakov. The Mother constantly contradicts her moral clichés in order to send away her daughter – rival and have the young man for herself. On a deeper level, there is of course the biting satire of Tsarist civil servants. The judge cannot make himself understood; the hospital director is the cause of illness of his patients by blatantly transgressing the lowest hygienic standards. From beginning till the end, the play succeeds in its wild ballet to captivate and mesmerize the public. It was a comical success then as it still is today. Like with “Dead Souls”, the subject was proposed by the Pouchkine. Gogol, in a letter dated, October 7, 1835, begged for an “authentic Russian” subject, preferably a comical anecdote, which Gogol promised to turn into a comedy. Comical subjects were no problem for Pouchkine, for he replied soon enough with an anecdote of what happened to journalist Paul Svinine while traveling the Bessarabia province. Svinine had arrived at a fair – was taken for someone else – welcomed by the Governor, “an honest fool”, – the governor's wife flirting with him – Svinine wooing the daughter. Gogol immediately went to work and finished all five acts of the play already before Christmas1835. While an influential friend, the intoxicating Mme Smirnov, convinced Czar Nicholas to endorse Gogol’s play, the writer prepared “The Revizor” for the stage. It went “en première”, before the Czar and his family, the court dignitaries and members of the high society on the evening of 19 April 1936 in the Alexander Theater in St Petersburg. 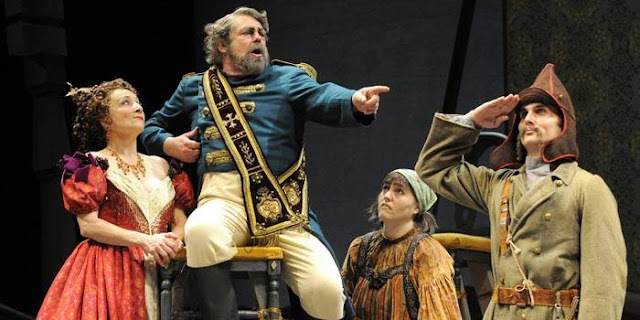 The content and meaning of the play still had to sink in, but by the next day, Gogol reading the opinions of the critics, understood that what he had meant as a comedy of errors, had turned at least for him into an error of a comedy. Gogol, himself a strong defender of the Government administration which he saw as « Providence represented on earth » was turned, against his will, into the mouthpiece of the liberal and the champion of the revolutionary intelligentsia. But Gogol was not a radical, nor even a liberal. He was strictly conservative. While hating the bureaucracy, yet he never found fault with the system itself or with the autocracy. His satire and ridicule were aimed not at causes, but at effects. Introducing a subject-matter that attacked the officialdom of the Russian bureaucracy, Gogol must have been quite naïve, if he did not expect at least part of the reaction. But his sensitive nature made him unable to cope with the situation and by the time the great Chtchepkine incarnated the Governor, in the successful June opening of the play in the little theater in Moscow, Gogol had already fled Russia. Still, during his self-inflicted exile, the play occupied Gogol’s mind. In a letter to his friend Pogodine, he rejected his work as “a stupidity” and wished a “mite” would devour all the existing copies of the “Revizor”. Gogol even started to rewrite the play, changing whole scenes. At the same time he wrote several drafts of the second part of “Dead Souls” but each time disgusted threw them to the flames. The once ambitious young man had turned into a hypochondriac riddled with self doubt. Ten years after that first staging before the Tsar, Gogol was still desperately trying to settle the matter. He went so far as to rewrite the end of the play as an allegory, explaining that the lost town in the Russian Tundra where “The Revizor” took place was a metaphor for our lost soul; he tried to convince the spectators that every character represented a specific passion and that Khlestakov was the devil who disturbed it all. But the author proved to be a poor critic of his own work. His creation overshadowed the creator and Actors, who had a feast starring in “The Revizor” and the public, simply refused this new version. It is a pity I could only “read” the play instead of attending a live performance of the “Revizor”. Only a stage representation where talented actors would express the hearty humor and develop the comical scenes in an interaction with an appreciative public, could do justice to what most Russians find “the best comedy in existence”. Even 175 years later and far away from Saint Petersburg, “The Revizor” has kept its universal appeal. It can be played today, quasi unchanged in every situation where an inspector visits a corrupt hierarchy and disturbs a picking order: Applicable in a business -, school- or any other environment, The Revizor’s satire will always work. And that is a good thing, for not willing to shed blood or burn buildings, our laugh might be the only protest we have left. Petr Alekseevic Kropotkin, Russian Literature.. London: Duckworth & Co., 1905.